According to Michael Schumacher’s manager Sabine Kehm, the former F1 driver has been showing signs up encouragement displaying moments of ‘consciousness and awakening’. Schumacher suffered a horrendous fall causing a severe head injury while skiing in the French Alps three months ago, since then the German has been in a medically induced coma at Grenoble Hospital. The staff at the hospital has been gradually trying to awake Schumacher; this news comes as the most positive yet. 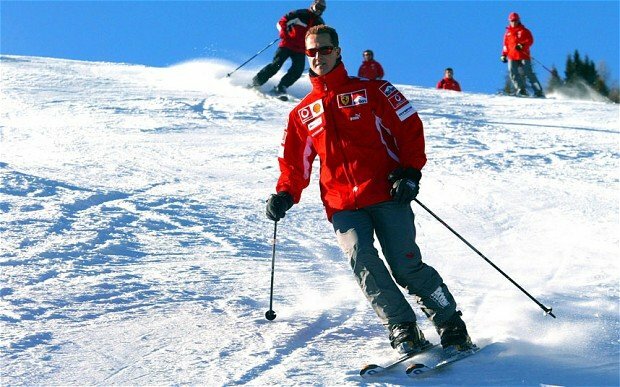 Investigators probing the accident said Schumacher had been going at the speed of “a very good skier” at the time of his crash in the resort of Meribel. Only last week it was reported that the family were planning to move former Ferrari driver from Grenoble Hospital, but his manager denied that was the case. Michael Schumacher manager Sabine Kehm said: ‘We are on his side during his long and difficult fight, together with the team of the hospital in Grenoble, and we keep remaining confident. Schumacher has been retired from F1 since 2012, during his 19-year racing career he has won two title, in 1994 and 1995 with Benetton, before he joined Ferrari in 1996 which he went on to win five straight titles from 2000. Great news to hear Michael Schumacher health is improving.